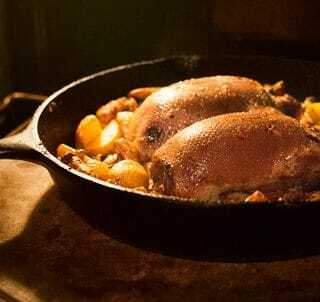 A perfect, whole roasted wild duck is more of an idea than a reality. It is virtually impossible to get that mystical combination of crispy skin, tender meat and just enough fat to make things interesting just by roasting a bird in an oven. You either get crispy skin and overcooked breast meat, or nicely cooked meat with skin that has not yet had enough time to crisp. That idea in your head of such perfection is like a teenager’s daydream of some swimsuit model or hot teen idol. Nice, gauzy, but not actually real. No, roasting a duck is more like a marriage: It hinges on compromise. Let me begin by saying you can’t really pull this off with domesticated ducks or geese, and even some of the hugely fat wild ducks we get here in California’s Central Valley are too fat for this recipe. Fat, as you might know, is an insulator and a lubricant. Too much and it will keep the skin too moist to crisp and shield the meat from the warm caresses of your oven. 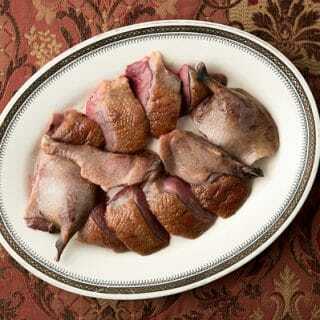 So start with any wild duck that has a layer of fat 1/8 inch or less on its breast. Yes, I know that a) this sounds insane to those of you living in migratory states, but believe me, we get such birds here; and b) there’s no way to truly test the actual thickness of the fat without removing the breast. Suffice to say that if, after plucking, you say to yourself, “Damn, that’s a fat duck!” don’t then use this recipe. Use my slow-roasted duck recipe instead. The key to success here is a hot oven. A really hot oven. I never roast whole ducks at less than 400°F and I prefer 500°F. I met someone the other day who roasts at 550° — all I can say to that is he’s got one hell of an oven! The smaller the bird, the hotter the oven. Teal cook better at about 500°F, while a big mallard, canvasback or small goose (Ross’, cackler, Aleutian, etc) will cook better closer to 450°F. Let your oven preheat a while, too. I have a pizza stone in mine, and I don’t put the bird in the oven until the stone hits the right temperature, which is usually 20 minutes after my oven tells me it’s there. You also need to decide where you want to be on the continuum of crispy skin to perfectly roasted meat. Obviously the longer you cook the more done your meat will be, and the more crispy your skin will be. Now I like breast meat medium-rare, but only when it’s just the breast. When it’s part of a whole duck, I take it to a solid medium, even medium-well: Still pink, but definitely cooked through. Why? So the legs can get cooked enough to eat. See? Like a marriage. Compromise. What you see in these pictures is a whole roasted canvasback, just cooked in a 475°F oven for 22 minutes. Everything is done, but as you can see there are spots on the legs where the skin is not crispy. I don’t mind this, but there is a way to get closer to that perfection, if you are willing to work for it. Optional Step No. 1: Sear the legs and wings in a pan before you roast the duck. I do this sometimes by putting a little duck fat in the pan I am going to roast the duck in and searing just the legs and wings of the bird while the oven is heating. I do this by holding the whole bird with tongs and continuously moving the bird around to get just the legs and wings, which need a little more time to cook. Optional Step No. 2: Once your duck has been roasted and rested, carve and then sear the skin to crisp it up. Again, I use the pan I roasted the ducks in, which will have plenty of fat that has come off the birds. This method can be very good when you find out your duck legs are really underdone. A quick sear on the meat side and the skin side usually gets them close to where you want them to be. When I am just roasting a bird on a weeknight I rarely do the optional steps, but if it’s a special occasion I will often do one or even both. Wild geese can be a little harder to roast. They tend to be older and tougher than ducks, but you can use this recipe easily for small geese such as Ross’ geese, Aleutians or cacklers or smallish specklebelly geese. Large geese, such as normal-sized specklebellies, snow geese and typical Canada geese can be roasted whole, but I don’t really recommend it. Giant Canadas are, in my experience, terrible roasted whole. As for sauces, I have a selection of wild game sauces elsewhere on this site. And perfect side dishes are mashed potatoes, polenta, roasted potatoes, spaetzle, etc. A good green salad is nice to cut the fattiness of the duck, too. Here is another way to roast a duck, but this is only if it is very fat. This is a recipe specifically for wild ducks that are not morbidly obese. It will not work well with hugely fat ducks or domestic ducks. For those ducks, use my slow roasted duck recipe. You will want to set the birds out for 30 minutes to an hour to warm up; roasting a cold duck doesn’t work well. Preheat oven to 450°F or higher. I often cook ducks at 500°F, and small ducks are best cooked at these high temperatures. (You can get away with 425°F if that's as high as your oven will go.) Let the oven preheat a good 20 to 30 minutes. Let the ducks rest at room temperature while the oven heats up. 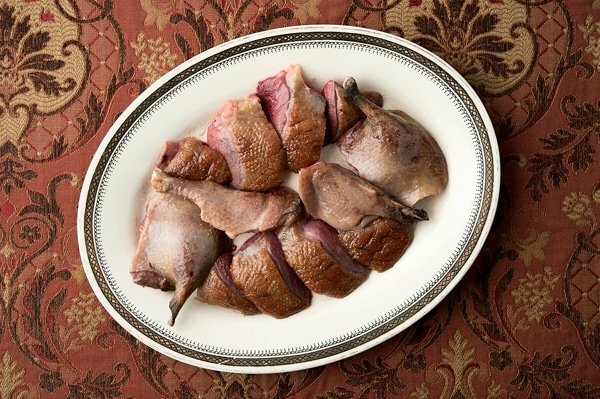 If the duck is reasonably fat, use a needle to pierce the skin where there is a lot of fat under it: The front of the breast, between the breast and legs, at the flanks, and all over the back of the bird. Be careful not to pierce the meat of the breast. Rub lemon over the bird and dust it with a good salt. Stuff the spent lemon or orange wedge inside the duck. 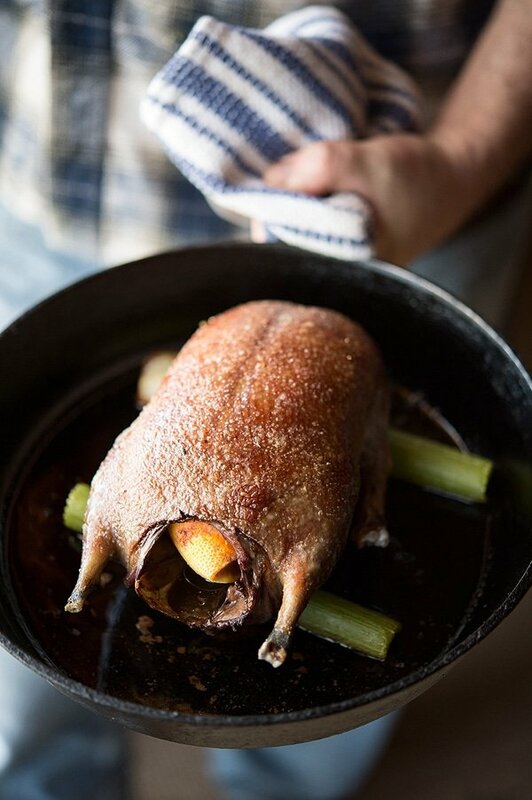 Place a few celery stalks onto an oven-proof pan (I use a cast-iron frying pan), arranging them so you can rest the ducks on top. This prevents the ducks from sitting in their own juices. 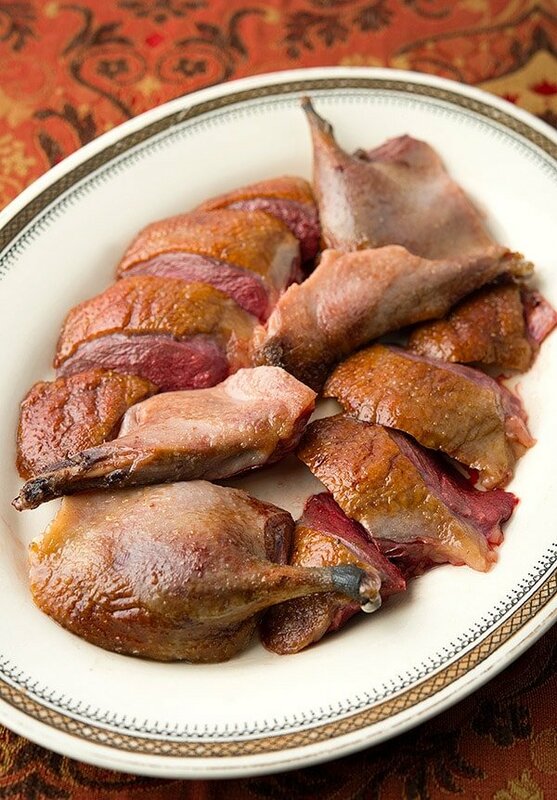 Roast in the oven as follows: About 10 to 15 minutes for teal or other small ducks, 13 to 20 minutes for anything up to the size of a gadwall, 18 to 25 minutes for a mallard or canvasback. The key here is an internal temperature of about 140 to 145°F at the deepest part of the breast meat, which is in the front third of the breast. Don’t have an instant read thermometer? Get one. Ducks need to be cooked medium-rare to medium. An overcooked duck is a sad thing. Take the duck out, move it to a cutting board and rest it. Let small ducks rest about 5 minutes. Large ducks need to rest closer to 10 minutes, and geese up to 15 minutes. If you want a simple pan sauce, remove the celery and stir a tablespoon or two of flour into the drippings. Let this cook on the stove (you might be able to do this solely with the residual heat in the hot pan until this roux is the color of coffee-with-cream. Add a tablespoon of Worcestershire sauce, some wine or brandy and the juice of a lemon. If the sauce is too thick, add a little water or stock. Whisk everything to combine and add salt to taste. Turn off the heat, add a tablespoon of minced parsley and a knob of butter. Swirl to combine and serve. 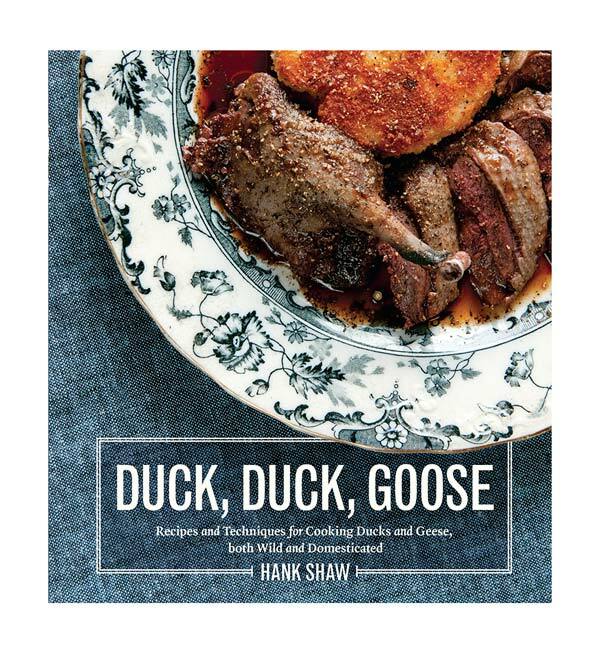 Looking for more duck and goose recipes? You’ll find dozens and dozens for both wild and farmed ducks and geese here on Hunter Angler Gardener Cook!